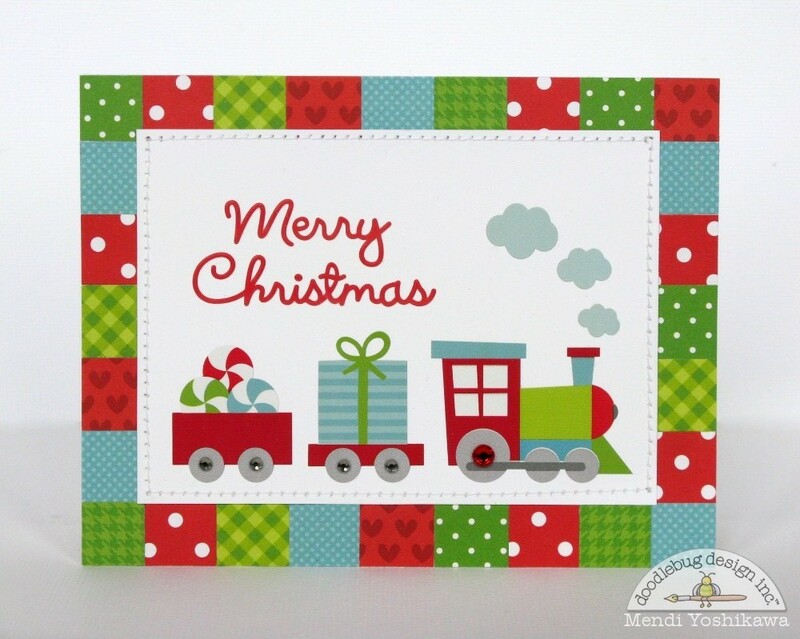 Doodlebug Design Inc Blog: Handmade Cards Are The Best! Hello there! It's starting to feel like Christmas around here which means it's a great time to get caught up on creating all your Christmas cards! 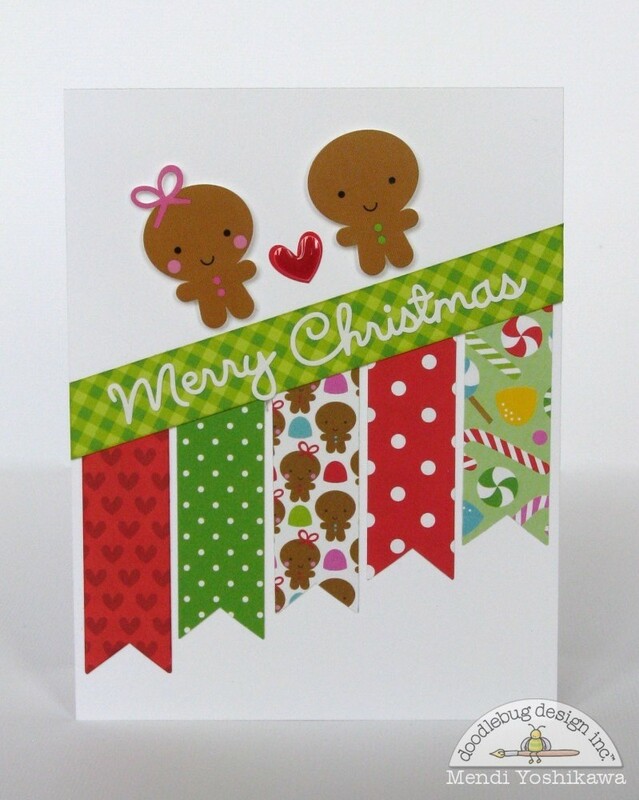 Up first I have a card using the darling gingerbread image from the collection. I cut my sentiment from the "very merry" paper. This sheet has so many darling images and sentiments that are perfect for cards! For my snow I cut a strip of lily white dot sugar coated cardstock and then punch one edge with a scalloped border punch. To finish it off, no project ever feels quite complete without a little bling so I embellished the stickers with pearls and jewels. My next card would be perfect for mass producing. It was quick and easy to make and best of all it's a great design for using up little bits of leftover paper. I think you could easily create multiples by just substituting the gingerbread with other darling characters from the collection (like Mr. & Mrs. Claus, Snowmen, reindeer, etc.). My train card is also great at utilizing leftover paper scraps. I think this design would go especially quick with the use of a small square punch (which is now on my wish list). My last card uses the Christmas tree gift tag as a focal point. I punched my sentiment from that same "very merry" paper and then embellished my tree with various sprinkles. 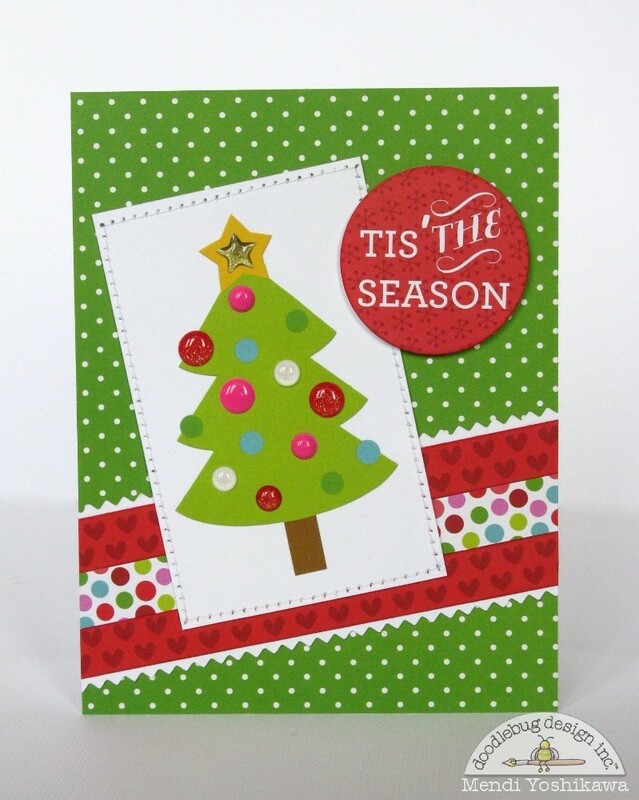 I adore the Christmas Tags Craft Kit in this collection--They really have some many fun uses! 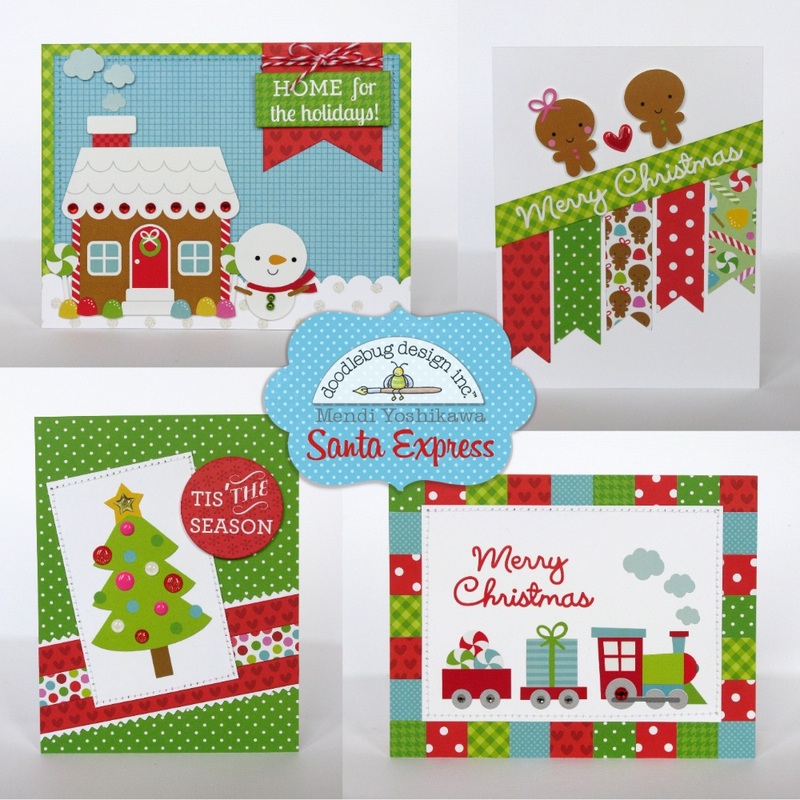 I hope I've inspired you to pour yourself a mug of hot cocoa, put on the Christmas music and gather up Doodlebug's new Santa Express collection to enjoy some of your own card-making fun! Super cute cards, love the beautiful embellishments you used. The little scenes you created on a couple of them are so adorable! Such pretty patterns and colors too! I have had a blast playing with Santa Express! These cards are so HAPPY! LOVE the designs of each of them => THANK YOU for the INSPIRATION!!! I've pinned them and look forward to starting my cards soon, time is definitely running out!!! These are so much fun! I love these simple, but sweet designs! Thanks so much for sharing! These are adorable & precious cards! Thanks for sharing! What can I say? Every single one of these cards just screams CUTENESS!!! Mendi is amazing and she has done it again with her super talented ways!! These cards are collectively adorable but individually they certainly still pack a wallop - Super cute and so well done!!! Cute,cute, cute, love your work Mendi.